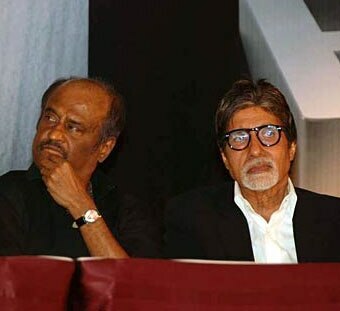 Rajnikanth was bragging to Amitabh Bachan one day, "You know, I kn...ow everyone. Just name someone, anyone, and I know them. Tired of his boasting, Amitabh Bachan called his bluff, "OK, Rajini how about Tom Cruise?" "Sure, yes, Tom and I are old friends, and I can prove it" Rajini said. And sure enough, Tom Cruise shouts : "Thalaiva! Great to see you! You And your friends come right in and join me for lunch!" ..."Yes", Rajini says, "I know him. coffee first and catch up". ..."Sure!" says Rajini, "My folks are from Italy and I've known the Pope a long time". Rajini and Amitabh Bachan are assembled with the masses in Vatican Square when Rajini says, "This will never work. I can't catch the Pope's eye among all these people. Tell you what, I know all the guards so let me just go upstairs and I'll come out on the balcony with the Pope." And he disappears into the crowd headed toward the Vatican.. Sure enough, half an hour later Rajini emerges with the Pope on the balcony. heart attack and is surrounded by paramedics. Rajini asks him, "What happened?" "Who's that on the balcony with Rajini?